The Brachos- Why through deception? If we think about the backhanded way in which Yackov “Took” the Brachos from Eisav, we notice that the only party involved who was interested in it taking place in such a manner was Rivkah. Yitschok was definitely not happy with this trick and neither was Yackov, who initially refused to cooperate on the grounds that even if it did succeed it would cause more harm than good- but was subsequently forced into it by his mother- who also assured him that she would bear any negative consequence that would result. The obvious question is what gain was there for Rivkah in outsmarting Yitschok so Yackov can get the Brachos? Can one steal something spiritual? Wouldn’t Yitschok know he was fooled just a mere few minutes after Yackov walked out? Wouldn’t Yitschok resent that, and try to undo what was done? Wouldn’t this cause tremendous friction in the family including between Yitschok and Yackov? Rav Hirsch offers a brilliant approach that settles the entire matter. For years Yitschok saw Eisav as the one bearing the torch of the house of Avraham. 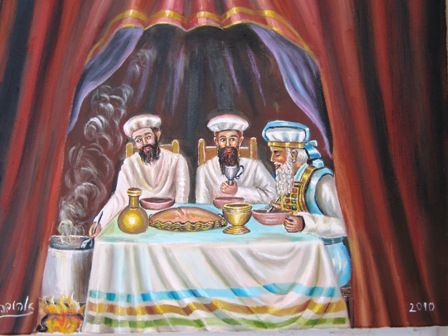 Eisav managed to fool Yitschok about his own righteousness, creating the impression the he and not Yackov was meant to get the Brachos to aid him in carrying out the mission that belonged to the house of Avraham. Rivkah however, was convinced that Yitschok was making a mistake and that Yackov was the rightful bearer of the family’s destiny. Although Rivkah tried to convince Yitschok of what she believed, and insisted that Eisav was not meant to get the brachos, she didn’t manage to fully convince him. All Rivkah was trying to achieve with this game was the game itself, not the actual brachos per see. Rivkah wanted to prove to Yitschok just how easy it was to fool him. If Yackov the ‘Tam’ can impersonate Eisav the ‘Tsayid’ and fool Yitschok, so too Eisav the ‘Tsayid’ can impersonate the ‘Tam’ and fool Yitschok. This also explains why Yitschok reaffirmed the Brachos to Yackov upon discovering that he was fooled. At that point he realized that he had erred all along and therefore he proclaimed that the one (Yackov) who got the brachos- “Baruch Yiyeh” should be blessed. This also explains how after such a loaded episode takes place Yitschok calls Yackov over and besses him with the “blessings of Avraham”. Now all is clear who the rightful owner of the brachos is. This can serve as a wakeup call for ourselves as to how careful we need to be not to be deceived, even by the people who are closest to us and we trust, as well, once we discover that we have been deceived to accept and act upon the reality- no matter how hard it is to accept. The 14 year Battle against E..